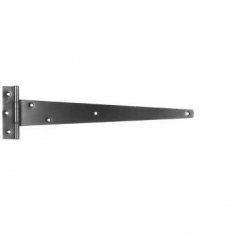 Tee hinges are often used in commercial or industrial settings, as they effectively distribute the weight of the door more evenly and reduce the burden placed on the hinges themselves. They can often be seen alongside thrust bearing hinges, which are designed to operate with low friction and heavy usage, and hook & band hinges which have increased resistance to weather and rust. We have a wide range of tee hinges for sale, as well as an impressive selection of more general-use fittings such as ball race hinges and their alternate version, the washered hinges. We also stock broad butts to accompany these fixtures for maximum effect. For heavy-duty applications, our heavy reversible hinges are perfect for suspending cast iron gates and other hefty arrangements, and our impressive selection of spring hinges will help deter even the most stubborn of thieves. If your needs are more domestic however, consider our collection of versatile light duty hinges. Suitable for smaller, more compact doors inside the house, these fittings resemble cabinet hinges and are most often utilised in kitchens and on cupboards. We also sell piano hinges for efficient operation of piano covers, and a large range of parliament hinges to help your doors bypass obstacles in tricky arrangements. All of our fixtures are available in a variety of designs, sizes and metal finishes for your convenience, so give Ironmongery Experts a call today for the very best in construction and joinery components.